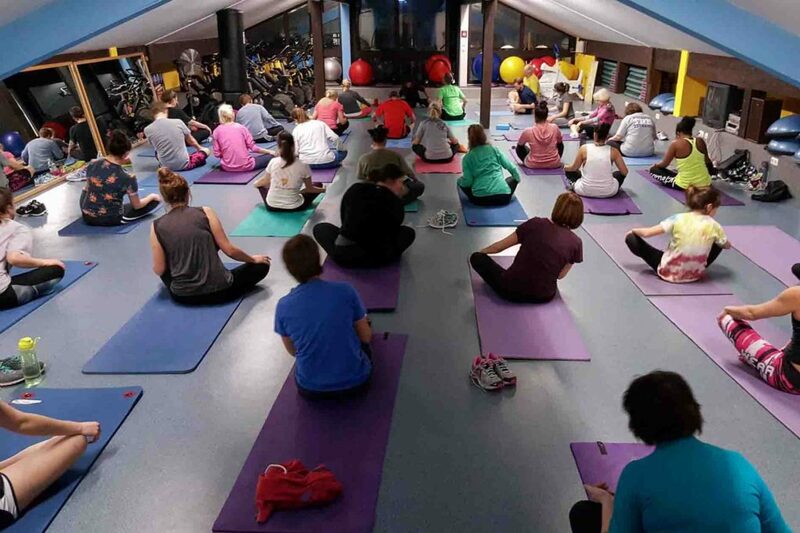 Several teams competing in the 2017 Healthy Lifestyle Challenge participate in a yoga class.The program included several special team events. Photo by Don Breisch, Mueller Fitness Center manager. 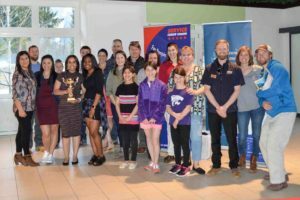 GARMISCH, Germany – The Garmisch Family and MWR Mueller Fitness Center completed its annual Healthy Lifestyle Challenge with more than 100 people in 16 teams participating from January 9 through March 5. Garmisch Family and MWR began the challenge 15 years ago as a way to encourage members of the community to start the New Year by adopting a healthy lifestyle and sustain good exercise routines. The staff at the fitness center began the challenge by conducting a participant fitness assessment and then conducted a final assessment at the end of the eight-week program. During the program, participants received weekly newsletters containing trending information on healthy diet options, recipes, training systems and weekly challenges. Additionally, contestants were expected to complete different tasks each week in order to receive bonus points – for example, teams competed for extra points by encouraging healthy eating habits during a vegetarian recipe exchange evening. Other team events included skiing, yoga nights and group training at the gym to bring out the team spirit during the challenge. The Healthy Lifestyle Challenge winners, the “Mamacitas”. Photo by Don Breisch, Mueller Fitness Center manager. This year’s challenge ended with 89 percent of the initial participants completing the program – an improvement of 25 percent from the year before. A total of 211 pounds were lost, 80 percent of the participants showed improvement in strength, and 31 percent of the participants showed cardiovascular improvement. The 16th Garmisch Healthy Lifestyle Challenge will start sometime in early January 2018.